An unaltered photocopy of your Authorization Letter obtained from The Office of Maritime Labor & Training, Maritime Administration. Contact The War Library if you do not have an Authorization Letter: 1-562-422-4100 (Pacific Time Zone). Don't forget to include an unaltered COPY of your Authorization Letter. 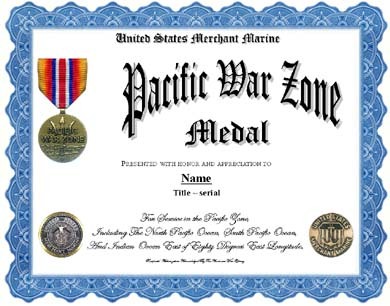 Pacific War Zone Medal, for merchant marine service in the Pacific War Zone, which included the North Pacific, South Pacific, and the Indian Ocean east of 80 degrees east longitude, during the period December 7, 1941, to March 2, 1946. Design: The trident, a symbol of naval prowess, rests upon a shaft of bamboo denoting the Pacific theatre of operations. The sea seascape suggests maritime activities and service. Some mariners who sailed in these wars never applied for the war zone ribbon bars. MARAD's authority to process applications for the original issuance of war zone bars expired in 1954. 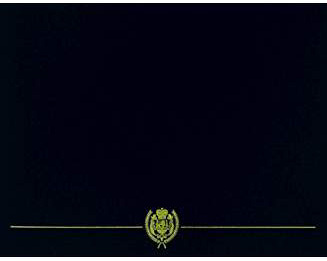 Under the new authority of Public Law 100-324, enacted in 1988, the Maritime Administration may again accept original applications for the decorations listed above.